Manager Gareth Conlan (centre) says TMHA's new Albury-Wodonga branch will deliver benefits for customers. 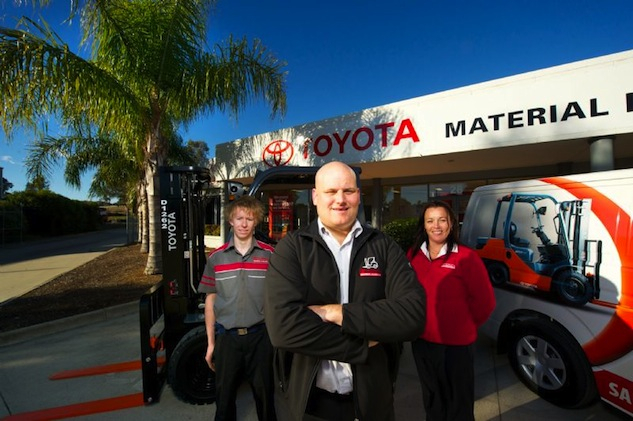 Toyota Material Handling Australia has now set up an Albury branch, serving as a direct presence within the region, while the existing Gladstone branch has moved to a larger premise. Gareth Conlan, the manager of TMHA’s Albury-Wodonga branch, said service vans based at the facility cover a wide area: east to Corryong, north to Wagga Wagga, south to Euroa and west to Yarrawonga. “Establishing a direct TMHA presence has many benefits for customers in the area,” Mr Conlan said. “We can now offer dedicated field support as well as a fully equipped service facility capable of handling all forklift and skid-steer loader jobs.Our six full-time technicians and their support staff are factory-backed and trained to the highest skill levels in the industry. Three fully equipped service vans provide scheduled on-site service and a 24/7 breakdown service. Customers now have access to our national network of factory-owned branches and resources,” he said. Steve Anderson, Gladstone branch manager, said his service technicians service a wide area: north to Rockhampton, south to Maryborough and west to Emerald. “The new premises offer a substantially larger workshop area and increased warehouse space for a wide range of spare parts.The new, larger workshop area means we can bring in forklifts for any major service and our earthmoving customers can have their Toyota Huski skid-steer loaders serviced in our facility,” Mr Anderson said. The TMHA Albury-Wodonga branch is at 28 Catherine Crescent, Lavington, NSW 2641. Telephone 1800 425 438; fax 6040 4610. The new TMHA Gladstone branch is at 19c Bensted Street, Gladstone, Queensland 4680. Telephone (07) 4972 6144; fax (07) 4976 9774.